In Wednesday’s post, Dynamically steering cities into the future, I reached the conclusion that it is only with feedback that we can adjust our path appropriately when needed. Without feedback, any adjustment is simply uninformed action. The world is changing in so many ways, it is not even possible to know what is changing and what it will turn into. The true work at hand is learning how to dynamically steer our cities into the future. We need to know our destination and then find the adjustments that will get us there. It means being open to feedback and willing to take action – at any and all scales. There is lots of work for us to do. As an individual, I follow my passion and look for people with whom I can exchange my passion for what I need for my livelihood. As a family, we work together to create a social and physical habitat that will support us, right down to this summer’s project: a new roof. My extended family goes for a backcountry hike each summer. This takes a lot of work to organize, and the payoff is time spent with each other and reconnection. I work as a consultant to a variety of organizations: cities, NGOs, corporations. I serve my neighbourhood organization as a volunteer. Much of my consulting work serves the whole city and its well-being. I am conscious of my actions that strengthen the connection between my city and its eco-region in my consulting work and our spending choices as a family. There are three additional scales at which I serve cities: I serve as president of the Alberta Professional Planners Institute, a body of 903 professionals serving human settlements Alberta, Nunavut and Northwest Territories. In a year’s time, I will be serving as APPI’s representative on the board of the Canadian Institute of Planners. I also serve as a founding member of a fledgling group, the Center for Human Emergence: Canada, part of a global constellation of organizations aiming to create the conditions for human understanding of, and responsibility for, the health of people and the planet, recognizing that everything and everyone is interwoven. At each scale, I can tease out the size and character of my habitat. As the scale grows, my habitat becomes larger and more complex. While the illustration in Figure A conveys that each city system is nested within larger systems, it does not convey that each larger system includes several, many, or thousands, or millions of the smaller systems. As the scale increases, the complexity increases. Over time, as our cities become larger and larger, they become more complex, but the importance of smaller city systems does not decline. Our work as individuals remains as critical as it ever was, for this is the scale at which we make our contributions. The city is only as healthy as each whole system – including each of us – that make up the city. Our work at every scale matters. In yesterday’s post, I reached the conclusion that the quality of the relationship between our economic life and our social and physical habitats dictates our ability to generate cities that meet our economic, social and physical needs. We create cities for the purpose of our individual and collective growth. We create them to support our evolution. 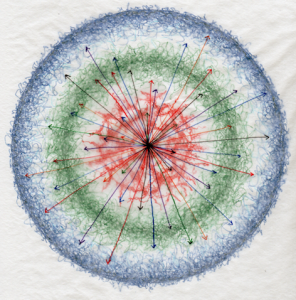 Consider this simplified illustration of the city dynamic (Figure A), where the red center is our economic life, and green and blue are our social and physical habitats. (For more information on the relationships between these three elements, please visit Cities need quality feedback.) The feedback between our economic life and our habitat is the information that flows back and forth. Feedback between our social and economic life is critical, as is feedback between our physical habitat and our economic life. The more activity between these spheres, the more responsive a city is to the needs of its inhabitants. For example, the illustration of activity in Figure B is less healthy than that of activity in Figure C in that it offers less feedback. Less feedback may mean lower adaptation of our economic life to meet the demands of our changing social and physical habitat. This perspective of the city’s habitats nests the physical, social and economic worlds. This understanding builds on the lineage of our current understanding of sustainable development, rooted in the World Commission on Environment and Development’s 1987 report, Our Common Future, often referred to as the Brundtland Commission. (Two links that might be of interest: the story, the report itself.) The inheritance offered by this report is the insertion, into our collective planetary consciousness, of the relationship between our physical, social and economic lives. This is now, rather conventionally, shown graphically as a Venn diagram (Figure D). The dynamic of the city habitat as I have described it here and in previous posts rearranges our understanding of sustainable development. Looking at cities from an evolutionary perspective, our physical habitat holds everything. Within that we have evolved socially to create opportunities for new work, a feature of our economic life that generates cities, and in turn recreates our physical habitat. 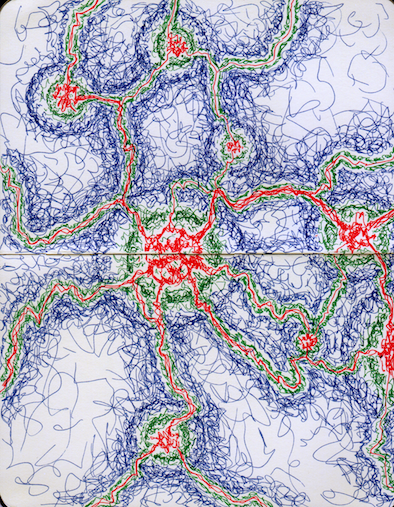 The city dynamic consists of endless feedback loops, going in all directions all at once (Figure C). Each sphere is critical, but with distinct roles to play. Unlike the Venn Diagram, each element is never fully on its own. It is all interwoven and interrelated. The development of new work means new ideas in response to life conditions. The expansion of new work means implementation in response to life conditions. The link between development and expansion of new work is habitat: life conditions. These principles and how they behave give us clues about how to organize ourselves, such that we tune into, and be in tune with our habitat. 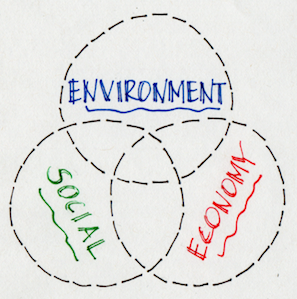 The interaction between these spheres is where the future lies for our cities. How we organize our cities to gain this feedback and respond to it is a necessary survival skill. With feedback, and appropriate responses to that feedback, we can adjust our path; without we can not. We need to approach our city systems in ways that allow for feedback and adjustment. Brian Robertson, and his work on holacracy, describes this as dynamic steering, where a system receives regular, real feedback and immediately adjusts. Imagine the system is you riding a bicycle. As you move along, you start to tip, you adjust. You see a pothole head, you adjust. You see what is coming and you adjust, but the truth is you never know ahead of time what will come and what the appropriate adjustment will be. Yet you are able to do it. Most systems we are familiar with, such as organizations, operate in predict-and-control mode, where we anticipate what is going to happen and make the adjustment prior to even seeing if the event unfolds as expected. We also make adjustments after events, assuming that future events will be the same and will need the same reaction. Predict-and-control mode does not allow for appropriate responses to life conditions because it allows only minimal feedback between the habitats of the city. Imagine riding a bicycle with arms out stiff in front of you; it doesn’t allow you to be responsive. We need cities to be responsive. In our cities, as when we ride a bicycle, our ability to keep our eyes on where we are going matters. Our ability to notice when we have moved off track matters. Our ability to choose to get back on track matters. Our ability to do the work at hand matters. Our very approach to our work matters. It also means that we have to have a bicycle that is in good working condition and does what we ask it to do. In today’s cities, with today’s challenges, we have an opportunity to be explicit about the cities we are creating and how they shape us in return. We have an opportunity to integrate our economic, social and physical worlds in such a way that will allow us to respond to the changing conditions in our world. Debating climate change is moot when the world is changing in so many ways. It is a distraction from the true work at hand – learning how to dynamically steer our cities into the future that allows life to flourish. Learning to be even more adaptable than we have been is key. It means being open to feedback and willing to take action – at any and all scales. There is lots of work for us to do. The next post will touch on the scales at which we work in our cities. Does the scale we work at matter? between economic life, through social habitat to physical habitat. In the first relationship, between our economic life and our social habitat, we make personal investments to come up with ideas and turn them into new work. Likewise, how we organize ourselves shapes our collective investment in the idea – the labour we put to it, the skills we put to it, or simply the ‘human potentialities’, as Jane Jacobs put it, shape what becomes of the idea. In the workplace or in a community, for example, new ways of thinking, making and doing new things emerge when welcome; they likely remain invisible or nonexistent if the social habitat is hostile. At a societal level, sometimes we just are not ready yet for new things until conditions change. Sixty years ago my home was built with no insulation. Energy prices were low and the notion of human-caused climate change did not exist. In contrast, today we have building codes with minimal requirements for energy efficiency and government grants to upgrade older homes. As our social habitat changes, so does our work. And as our work changes, so does our social habitat. Notice the adjustments we have made to life with computers, the internet, social media, etc. This relationship between our social habitat and our economic life is critical to Jacobs’ refueling principle: “… no matter how efficient a cow may be, if it doesn’t self-refuel, it’s a dead cow. Self-refueling is so fundamental to survival, and to all other process of life made possible by survival, that conceptions of whether it is a good or bad thing are pointless.” The ideas that survive in cities (new work) must be applied or used for economic life to thrive. This is the essence of refueling – capture the good ideas, let new ideas emerge from them, try them out, see if more new ideas emerge. The more this takes place, the stronger and healthier our economic life. In our social habitat, we must create the appropriate ‘equipment’ to capture and make use of the ideas, as well as finding additional ways to capture ideas. The social habitat supports, hinders, or removes our ability to self-refuel. This is where we demonstrate our tolerance for diversity, new work and change. The second relationship in the city habitat is between the social habitat and the physical habitat. This is where we notice our physical conditions and whether they are changing or not. This relationship is about our receptivity to our physical reality, when we notice how habitat creates us and how we create habitat. An open relationship between our social and physical habitats is exemplified by our ability to take in the good and bad news. The third relationship in the city habitat, between economic life and physical habitat involves travelling through the social habitat. 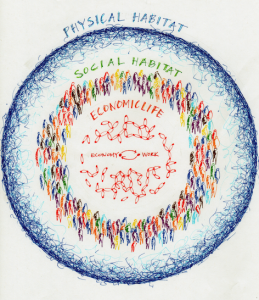 Our social habitat creates the conditions for a relationship with our physical habitat and our economic life and between our physical habitat and our economic life. In this relationship we recognize explicitly that the city affects our work and that our work affects our city. We boldly look for feedback to link the three spheres. Each of these relationships involves our social habitat, where there are degrees of mutual support and information exchange. On a continuum, we are either open to the exchanges between habitats, or closed. Like a tap, the choice is open with maximum flow, or closed with no flow. In the middle the tap is open partway, with flow constricted. And the degree of relationship compounds: the first two relationships must be open in order for the third relationship to take place. If one is open only partially, the third relationship will also be partial; it is only as open as its constituent relationships. As a whole, the city is a habitat that encompasses our economic, social and physical habitats. Our social habitat allows the new work that creates and recreates our cities to take place in the context of our physical habitat. 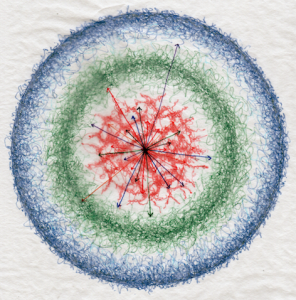 This means that new work is needed to create a social sphere that allows the necessary data to go back and forth between our physical environment and our economic life. The quality of the relationship between our economic life and our social and physical habitats dictates our ability to generate cities that meet our economic, social and physical needs. This framing reorganizes how we think of balancing the well-being of economic, social and physical factors for sustainable development. My next post will explore the value of reorganizing these elements. To organize ourselves to ensure our species is able to sustain itself, we need to fully contemplate the relationship we have with our work, and our work’s relationship with our habitat. Figure A illustrates this relationship. The development of cities is a survival skill. When I say this, I mean the development of diverse and innovative work in cities is a survival skill. It forms what Jane Jacobs’ referred to as our economic life – the force that creates and sustains cities. The work we do creates our cities. This post begins to articulate further the relationship between our economic life – our work – and our habitat. At the center of the illustration is economic life – the sphere where we work. Our work, at a minimum, is to ensure personal well-being of self and family. It most often involves a relationship with something, or someone else. If no one did any work, if no one ‘lifted a finger’ we would not exist. There is always work to do. We have to make an effort to survive; it doesn’t just happen. The location of work varies greatly: it can be at home, out in the fields or the barn, on a construction site, in an office, or on a train. Our work is generally a transaction for something in return. When times are tight, work may be building shelter and growing food for family. If the skills to do this are not on hand, we work for others in return for those skills, or do something to barter for those skills. Moreover, the work done in cities is a transaction that results in money for the worker that is exchanged for shelter, food, clothing. And, if affluent enough, the worker purchases additional things for enjoyment. Or we may make work transactions with no money changing hands and instead a service changes hands, such as when we volunteer for a community event or work in our homes. There are paid and unpaid jobs everywhere. The common thread in our work lives is a transaction with others. Very rarely, as a species, do we live alone. We are regularly in contact with others and we have chosen to live in communities, towns and ever-growing cities, and the source of our contact is in the exchange of work. Our economic life, the sphere in which we exchange our work with one another, is at the heart of the dynamic from which cities are created and recreate themselves. But it is not as simple as being in contact with each other. New work must be generated. At the scale of the city, our economic life is the accumulation of all our work, combining and interacting, transacting. Our work creates our social, physical and economic worlds; this is what builds our cities. We inherit our physical habitat, but our work changes our habitat. We build settlements, roads, swimming pools and airports. We all build and create: individually we plant flowers, maintain our homes, build garages; collectively we build highways, schools, and businesses. The outer ring of the illustration is our physical habitat, which is both the habitat we are given and the habitat that is physically created by our work. 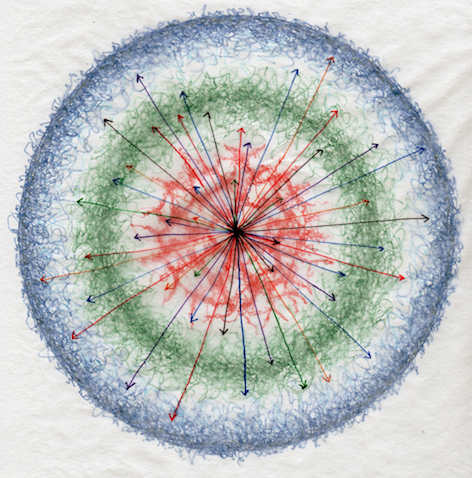 The outer ring of this illustration is the physical habitat in which we live. A city’s very existence hangs on its environmental (physical) context. Our economic life is very connected to our physical habitat. A settlement begins with the inheritance of a resource. As I write from Alberta, Canada, I am compelled to notice that my province’s economic life today relies on the oil and gas resources within our boundaries. As we have developed this resource, our physical habitat has changed along with our activity. Oil wells, mines, equipment and roads cover the landscape. We have grown cities and built new cities to accommodate the extraction of oil and gas for cities across the planet. Our physical habitat also includes the spaces we do not include as traditionally being within the city. It must include all of the land that supports the city: the land and water from which food is grown and water is provided for citizens. It includes these resources and others that allow us the life we have: transportation, buildings, recreation, business, government, etc. It includes the impact of our activity, individually and locally, as well as collectively and globally, on our planet. At the outset of a settlement, the physical habitat gives us the opportunity to develop new work with a resource. We have also, historically, created new work to accommodate a changing climate. New work in the context of our habitat continues to be an operating principle today. The habitat for most humans is now the city, which generates the conditions for more diverse work, which means we generate more change to which we must adapt. The physical habitat we build – cities – generates the conditions for more new work, which grows our cities. 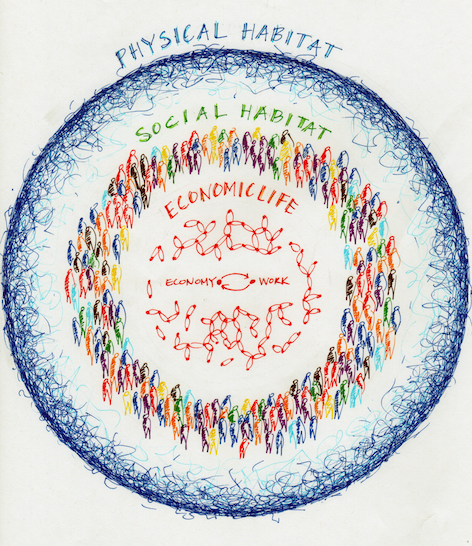 In the middle of these two elements is our social habitat, the connective tissue between our economic life and our physical habitat. From our African ancestors until now, it is clear that we are social creatures that gather and work together to ensure we do more than simply survive. Whether implicit or explicit, the reason we gather is that it affords us the ability to create the conditions to find new and improved ways of doing things. Together, rather than alone, we best face the challenges put to us. Not only do we physically create cities to face our challenges, but we also create a social habitat conducive to this. The quality of our social life – our social habitat – has an impact on our economic life and our ability to create the conditions to thrive. Cities are where we organize ourselves with social structures to create the world we live in, and, of course, be recreated by what we create. Cities are the world in which we look after self and other. Our economic life is at the heart of our ability to create and recreate cities that respond to our changing world. Our social and physical habitats are always in flux and we shift and adjust our behaviour – our economic life – to learn and evolve. Building cities is a never-ending quest to do much more than survive. This quest takes place at many scales in the city, in what Marilyn Hamilton has articulated as a nest of city systems (Figure B). Moreover, our very work to adjust (at any scale) creates new conditions to which we must respond again, and again, and again… Cities are the result of our evolving interaction with our habitat.